This is a brilliant, uplifting debut novel that harks back to the likes of Nick Hornby's, High Fidelity, combining life, love and music into one compelling story, reaffirming my belief that lad lit is a genre that deserves far more credit and coverage than it currently receives. The story is solid with great characters. I loved the main character (Nick), and could relate to him so well, especially his inner monologue when wrestling with the many questions that arise in the face of uncertainty. We've all gone through heartache before but we don't all fall into a world beyond our comfort zone immediately afterwards. In this case, that world plays an integral part to the story, being set within the Boston indie underground music scene, with the focus on the young, talented singer, and Nick’s love interest, Alli, who’s naïve and socially awkward approach to life is just as charming as her pitch perfect vocal. The way the author describes her live performances, you almost feel placed at the gig itself and can hear Alli’s dulcet tones lifting from the page, bringing to life the emotional aspect of her personality. 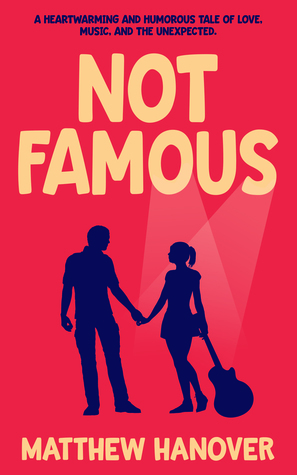 I was hooked from the first page with ‘Not Famous’, and it’s been a while since a book has managed to grip me to such a level where I had a compulsive and desperate need to finish it quickly to find out what happens at the end. It’s funny, easy to read and heart-rendering with a couple of little twists along the way, but more importantly, it was unputdownable! You won’t be disappointed!